Ethereum (ETH) hit a new 2018 low this week of BTC0.042. A number of factors seem to have impacted this price trend. We believe the severity of this price slump to largely be a result of exiting ICO project owners, who decided to cash out ETH into BTC or fiat currencies in the recent market downturn. Such decisions could help explain the recent volatility of ETH over BTC, as noted in our Chart of the Week. The project stage of projects pursuing ICOs is becoming increasingly immature, and 57% of ICO projects began fundraising with nothing more than an idea in Q2 2018 (versus 47% in Q1 2018). This implies more projects with limited resources committed, resulting in lower costs of exiting. -55.38%, compared to +49.32% in Q1 2018. 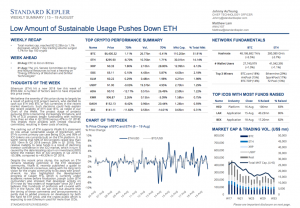 Despite the recent price slump, the outlook on ETH remains relatively optimistic in the ETH developer community. Vitalik B. recently published a guide to 99% fault tolerant consensus, along with his long term vision for the crypto community to do away with proof-of-work. He also highlighted the development progress of Casper FFG, which is currently under academic review before finalization. Joseph Lubin (ETH co-founder) also stressed that developer activity on ETH rose by “two orders of magnitude” since 2017 and believes that hundreds of protocols will co-exist with ETH in the future. Still, we can only but assume that the timing of these comments and announcements is partly due to added pressure on developers by both the hard hit ETH price, and the crypto public which is expecting to see Ethereum used for more than ICOs.